I was surprised to learn how old our fleet of nuclear power plants is. Although as technology has improved, facilities have been updated, but most of our reactors were built in the 1970s. 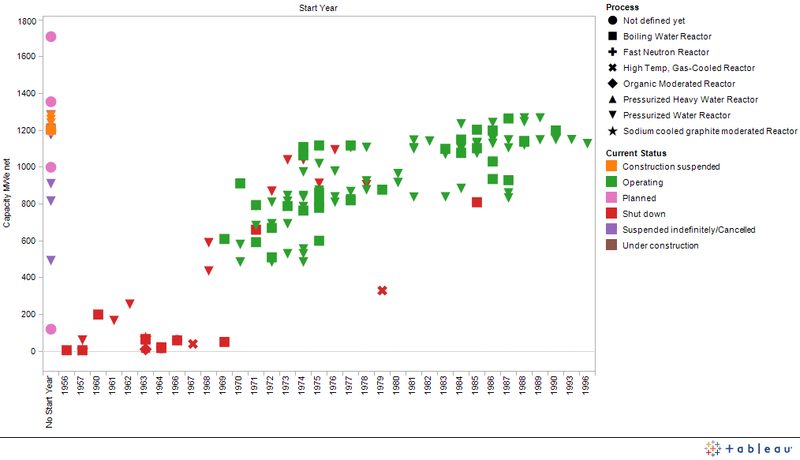 The chart below shows the number of reactors in each year in which the reactor came online, the Start Year. You can see that most of our current production capacity came online during the early 1970s and then the 1980s. The red bars indicate reactors capacity that has been shut down. One of the things I like best about learning data visualization is trying to see how many dimensions of information I can present in one image. The chart above had three, start year, production capacity, and status. In the chart below, I’ve added another dimension. 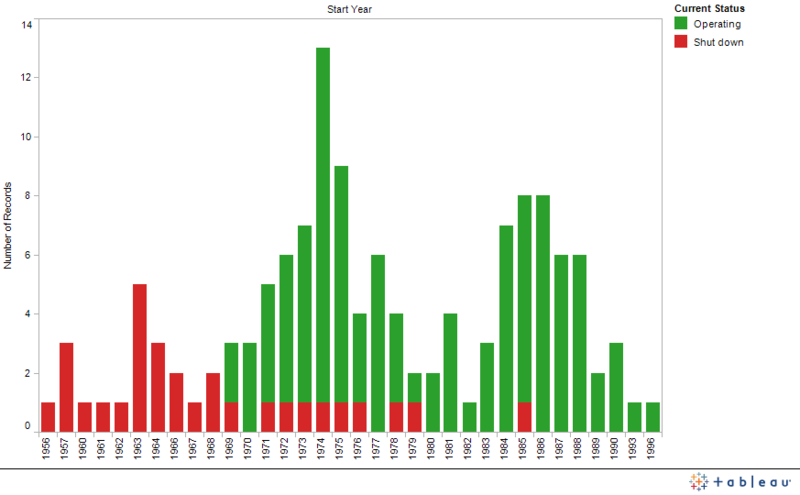 Here, the graph shows each individual plant as a symbol on it’s location by start year and MW produced. You can clearly see that the capacity has increased for the newer plants. The symbols are also color coded by status. To the left of the graph, there is a column for “No Start Year” which show the reactors were construction has been suspended or halted, or reactors that have never made it past the planning stage. Finally, I gave the symbols different shapes to represent the different types of nuclear reactors. Most of the nuclear reactors in the more recent decades are shown by squares and upside-down triangles. The squares represent Boiling Water Reactors (35 currently running), and the upside-down triangles represent Pressurized Water Reactors (69 currently running). In the US, these are the only currently operating types, but there are some red symbols representing other designs that have been phased out. So, which visualizations did you like best? What helped you learn something interesting about nuclear power in the US without cluttering up the image (and you brain) with less interesting details. I really enjoyed playing with Tableau, so I think I might start a hunt for a new website that will support these graphics in their full power. Suggestions welcome! This entry was posted in Data Vis Diary, Xylem and tagged Data Vis, energy, nuclear power by kateprengaman. Bookmark the permalink.